Fall is here, the leaves are turning the most wonderful colors of copper, green, orange, yellow and red. BERNINA Ambassador, Heidi Lund, would like to show you how to make these delightful three dimensional Free-motion Stitched Thread Leaves. 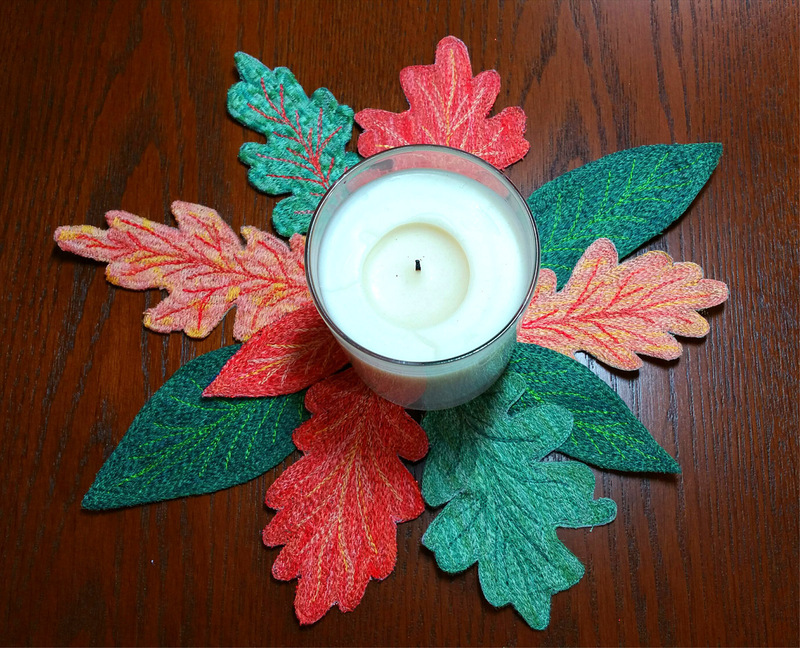 You can use them to decorate your fall table or mantle, or to add to gifts and cards. 1/4 yard wash-away stabilizer (I use Fabri-Solvy), or you can use the wash-away stabilizer from OESD. 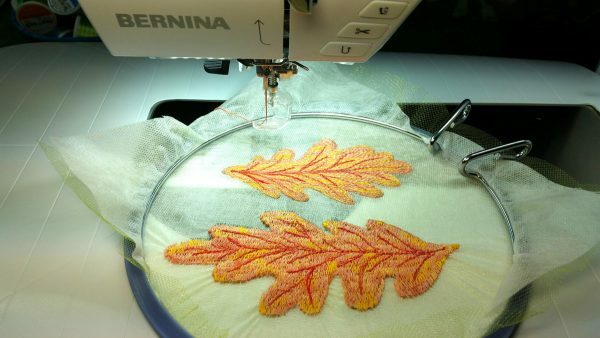 Your local BERNINA store might have some in stock. Cut a piece of tulle/organdy and a piece of wash away stabilizer large enough to fit your spring hoop. 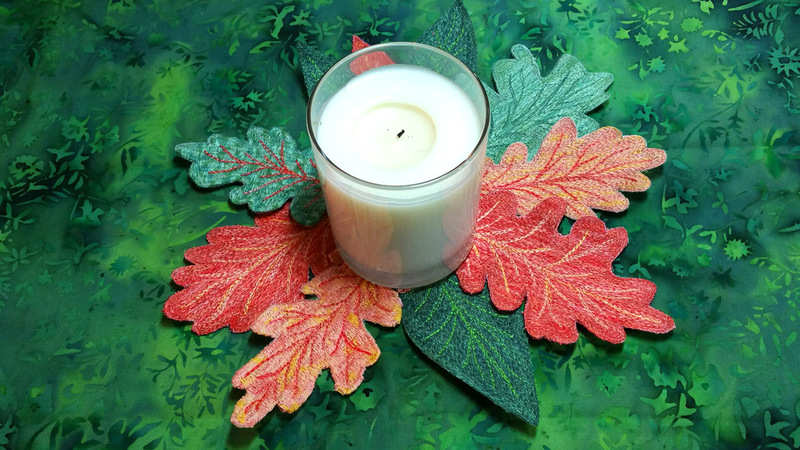 I use the tulle/organdy as an additional stabilizer in the leaves. It also gives your free-motion something to hold on to once you wash out the stabilizer so that if you accidentally cut your leaf while trimming, it will not unravel. 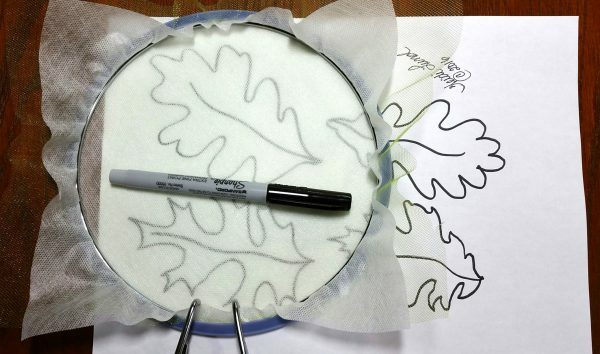 Using the leaf template downloaded from materials list above, trace a leaf or two onto your wash-away stabilizer using a fine point marker. 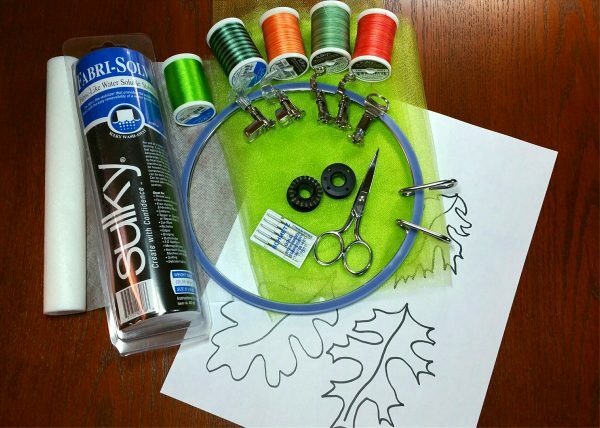 Load your spring hoop by placing the tulle on the bottom, then the stabilizer with the traced leaf on top. 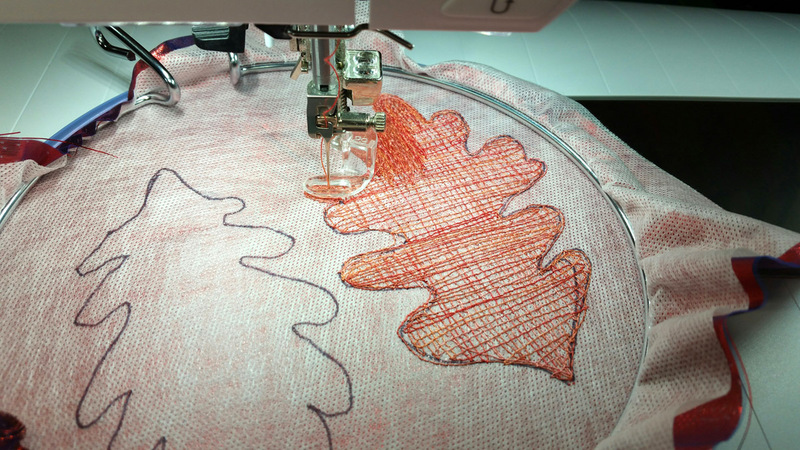 Set up your sewing machine up for free-motion stitching. I am using Quilting foot #29, use whichever free-motion foot you feel most comfortable with. Load your machine with the same cotton or rayon thread in both the top and in the bobbin. Use a 75/11 Embroidery needle. This needle size keeps from making big holes in the tulle and stabilizer as you sew back and forth. If you are using a thick cotton thread, you may need to jump up to a size 80/12 needle. 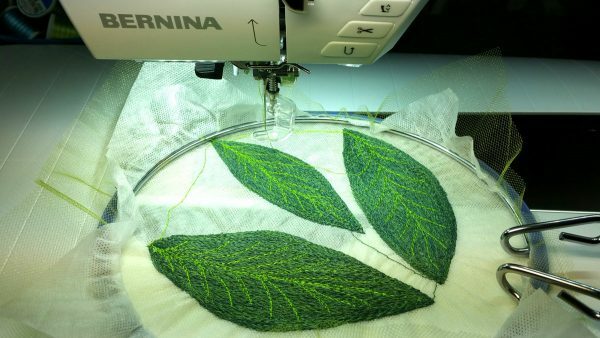 Using straight stitch free-motion stitching, outline the leaf shape in the hoop, then go back and forth and make a grid-work of straight stitches. 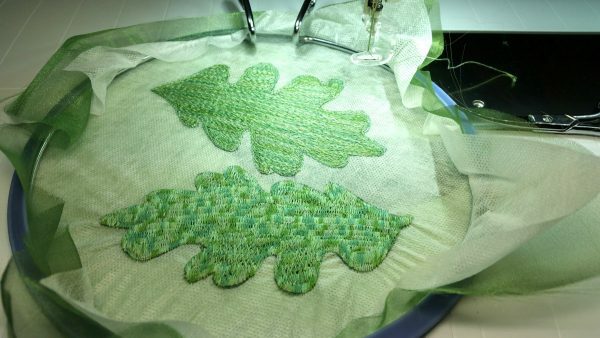 Once your grid-work is completed, you can choose to continue to use straight stitch free-motion to fill in the leaf, or you can switch to free-motion zig-zag to use as your filler. Depending on your thread, you can get several different looks for the leaves. 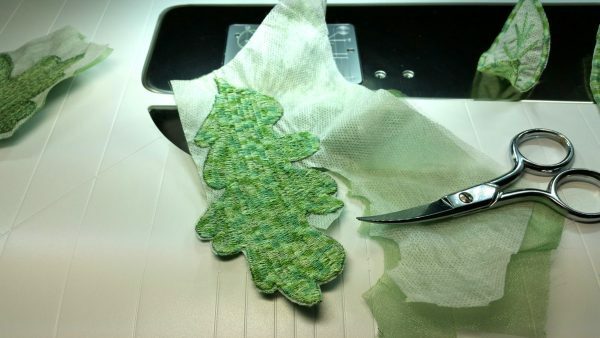 Once stitching is complete, use sharp scissors to carefully cut out your leaves. Rinse the water soluble stabilizer out by soaking them in warm water. Allow to air dry. 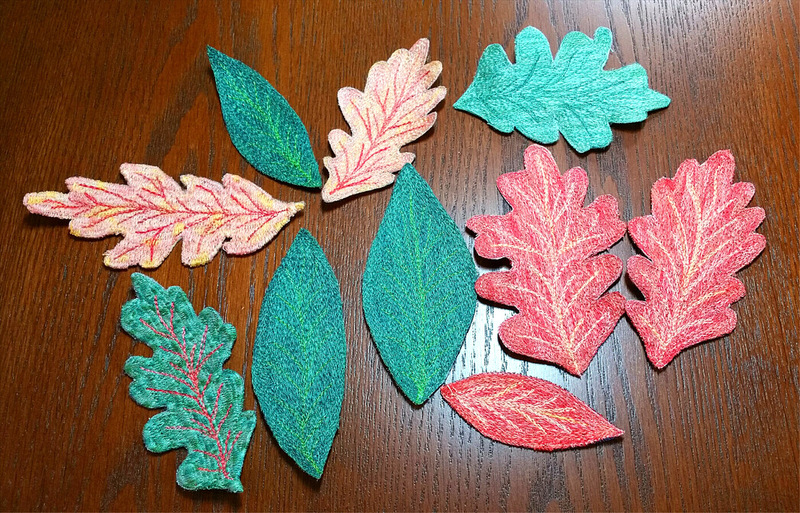 Now that you have the hang of it, these leaves are addicting and have so many uses! You can choose to make leaves of all different sizes and can change your threads to add veins of different colors. With so many great threads to choose from, you can use one that is monochromatic or one that stands out like a variegated. You can even embellish them with fanciful decorative thread work, metallic threads or even beads. For those of you with embroidery machines, you can do this technique using an embroidery pattern that you already own or you can digitize a leaf. I like to pick up leaves from my yard or on my walks. If I like the shape, I lay them on a copy machine, cover them with a piece of white paper and make a photocopy. This gives me the outside leaf shape to use as a template for future leaves. Once you have made a stack of loose leaves, you can decorate a tabletop or a mantle and add candles. Stitch together in a garland to decorate your walls. 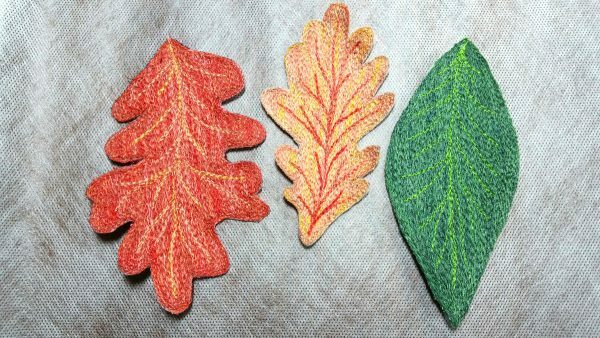 Use them on a wreath, a gift bag, for embellishing a hat or garment. Best thing is, they are washable too. Stay warm and dry this fall. Cheers. This is a lovely idea. Excellent free motion practise, but I shall cheat with embroidery software V8!